As the days grow colder and the leaves acquire their seasonal golden hue, there are few things nicer than a little something sweet to warm you on even the chilliest of days. In fact, why settle for just a little something sweet when you could have an entire celebration? The Month of Gathering is host to easily the most delicious festival in all of Neopia—the Chocolate Ball! In order to prepare for this scrumptious occasion, I’ve compiled a mouth-watering list of Neopia’s finest pets and petpets to give you a view of the tasty festivities! The Chocolate Ogrin features many characteristics of the classic Chocolate pet, from its fluffy whipped-cream fur to the delicate white chocolate stripes across its back and ankles. What really makes the Ogrin a stand-out Chocolate pet is its mane, comprised of whimsically flaky chocolate shavings. A delightful mix of dark and white chocolates, the Chocolate Ogrin is as charming as it is mouth-watering! One of the most detailed Chocolate pets, the Chocolate JubJub has something for every sweet-lover. The cherry that rests atop its sprinkle-coated whipped-cream head is a nice tart contrast to the milder milk chocolate of its body, and its fudge-coated waffle cone feet provide a nice crispiness to its step. With subtle dark chocolate swirls and white chocolate stripes, the JubJub is the perfect little truffle. Halloween has come early with the Chocolate Scorchio! Definitely more treat than trick, the Chocolate Scorchio has a classic milk chocolate hard-shelled body and a super sweet white chocolate belly. The white chocolate continues onto the wings for a very well-balanced look. The most remarkable part about the Chocolate Scorchio, however, is the sugary spikes of candy corn that line its head and tail. Though several other Chocolate pets feature candy corn hands or feet, the Scorchio is the only one to use this Halloween staple in its classic shape. 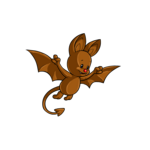 Easily the most understated of all the Chocolate pets, one may wonder what is so special about the Chocolate Korbat. However, take a trip to the Chocolate Factory in the Neopian Bazaar, and you’ll realize that the Chocolate Korbat is the exact replica of the Milk Chocolate Korbat, its actual candy counterpart. Differentiated only by its petit cherry nose (thus done so it isn’t actually confused with candy and consumed), the Chocolate Korbat is easily the most accurate Chocolate pet. The Chocolate Chomby takes the cake for best use of waffle cone with its back and tail spikes; the cone is even crooked and flaking to look as though the Chomby might have taken a few nibbles off its back. The Chocolate Chomby also features intricate white chocolate designs on its nose and torso, and a cresting wave of whipped-cream atop its smooth dark chocolate head. An oozing trail of hot fudge down its back is the finishing touch to this Cretaceous confection. 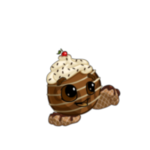 Now that you’re drooling so much it’d make Healing Springs look like a dew-droplet, let’s move on to Chocolate petpets! * The perfect companion for any candy-themed pet, Chocolate petpets are also the results of a terrifying experiment, the Petpet Lab Ray. Because of this, none of them are displayed at the Rainbow Pool, leading to the common misconception that Chocolate petpets do not actually exist. While they may be harder to come across, several of these culinary companions certainly make their presence felt! In all my travels of Neopia, I have yet to meet someone who does not even give the smallest of chuckles at the sight of the Chocolate Intesteen. As unappetizing as its name, the Chocolate Intesteen looks like a bar of milk chocolate left out in the sun. Its shriveled body is in the typical Intesteen shape, and the cracks in its chocolate shell only add to the illusion. If you ever thought there was a piece of chocolate you wouldn’t want to eat, the Chocolate Intesteen puts that notion to rest. Mmmmm, who could resist the Chocolate Magmut? Don’t be fooled by its basic milk chocolate body—this petpet is covered in mini rainbow sprinkles! It is also the only Chocolate petpet to feature nuts in it, offering a jolly almond crunch to its otherwise creamy form. But the Chocolate Magmut doesn’t stop there! Not satisfied with the traditional single cherry on top, the Chocolate Magmut has three cherries trailing down its mane of whipped-cream. This is one Chocolate petpet that goes above and beyond the call of candy! 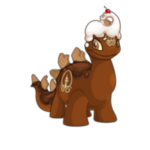 If you’re looking for a unique Chocolate petpet, look no further than the Chocolate Snowbunny. Minimalist in its details, the Chocolate Snowbunny features only a dollop of whipped-cream for its tail and fudge-dipped ears and feet. 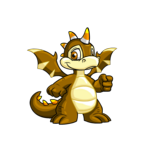 What makes this petpet so spectacular, however, is only hinted at by its reddish hue. Yes, that’s right; the Chocolate Snowbunny is the only living creature to be made of Cornupepper chocolate! The Cornupepper, which can only grow in the hottest regions of Mystery Island, is easily the spiciest food in all of Neopia. Don’t worry, though—the Cornupepper power is mixed with the sweetest milk chocolate available, giving the Chocolate Snowbunny the perfect kick of spice without making your eyes water. Not to be outdone by its Chocolate comrades, the Chocolate Babyca brings its own flavor to the bunch with its caramel sauce top. Flecked with bits of toffee, the gooey caramelly goodness drizzles from the Chocolate Babyca’s ears all the way down to its tapping toes, making this mischievous petpet one of the sweetest. The finishing detail is the Chocolate Babyca’s tail, which comes in the form of an elegant dark chocolate shaving. And finally, we come to the only Chocolate petpet which has a chance of competing with the Chocolate Intesteen for funniest design: the Chocolate Pile of Soot! Like the others, the Pile of Soot is a petpet only available from the Petpet Lab Ray, and cannot be purchased or gifted. The only Pile of Soot to come in a fancy color, this Chocolate petpet shuns the traditional chocolate shell and is instead made entirely of cocoa powder! The pièce de résistance is the whipped-cream “smoke” coming off of its head. Just don’t try to mix it into a glass of milk! Well, that just about covers it. Keep in mind I’ve only scratched the surface on wonderful Chocolate pets and petpets in Neopia, not to mention the delicious Chocolate wearables and foods! Hopefully this article has prepped your taste buds for the glorious explosion of chocolate out there. Enjoy it while it’s here, and don’t forget to stock up on Bloat-B-Gone! There's a strange smell in the air tonight, as you walk through the mist covered town of the Haunted Woods. Rock has many different meanings. Being made of chocolate has its merits. "If one cannot close on the day the world ends, when can one close?"